The bendable, snap-on handle is a convenient and safe way to carry the instrument into the mouth and the restoration out. The handle also prevents dropping the instrument and/or the crown or bridge in the patients mouth. It can be removed when threading a restoration out-side the mouth. Used to thread into the occlusal surface of a crown and break the cement layer, which secures the crown on the tooth thereby removing it. It is used by threading the channel made by the Regular Metalift CBRS Bur, commonly called the Metalift Instrument or Metalift CBRS Instrument. Used to thread into the metal occlusal surfaces, which are too thin to be removed with the Regular Crown Removal Instrument. It is also used in the rare case where very heavy turning forces are required due to an extremely retentive crown. Used to go into the threaded channel created by the Regular Crown Removal Instrument, prior to recementing the crown or fixed bridge. This facilitates removal at a later date if necessary. There are two (2) lengths of these supplied in the kit. There is a regular length (1/16") and the long (3/32") for use in thick occlusals. Special longer keys are available for cases with greater occlusal clearance. Wax and soap also work well as a lubricant. Used to go into the threaded channel created by the Magnum Crown Removal Instrument. These only come in one length, 1/16". Used to lubricate the Metalift CBRS Burs and Crown Removers to function more efficiently and effectively. Also prolongs the life of the instruments. Wax and soap also work well as a lubricant. Used to put a pilot hole (or you can call it the initial hole) in the occlusal metal surface of the crown. Used to place a precise channel in the occlusal surface of the crown. This precise channel accepts the Crown Removal Instrument. The Regular CBRS Bur is used in conjunction with the Regular Crown Removal Instrument. 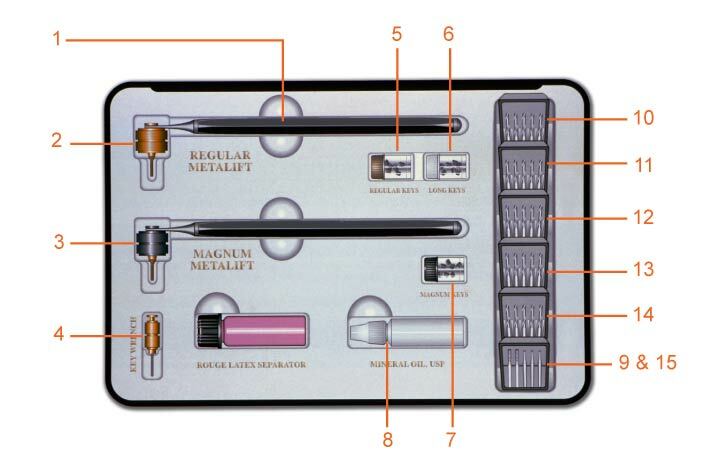 The Magnum CBRS Bur is used in conjunction with the Magnum Crown Removal Instrument. These burs are actually twist drills. A twist drill cuts only at its tip as it penetrates into the metal. They have twin helical flutes that wind around the shaft in a tight spiral, removing metal chips from the channel as it cuts and leaves a precise diameter channel. The Small and Medium CBRS Burs are used on non-precious and other very hard alloys to gradually step up the size of the pilot hole. This facilitates making the precision channel with the Regular CBRS twist drill. This bur can be used routinely after making the precision channel to undermine the dentin one quarter of a mm under the crown. By using it at his point you can verify that you are all the way through the particles coming from the channel. This bur is also used to remove threads inadvertently created by going too far into the tooth structure below the crown. If you are not familiar with this number diamond, it is approximately the shape of a 560 carbide. This is used to remove the porcelain on the occlusal surface of porcelain fused to metal crowns to gain access to the metal coping or substructure. This is not used on metal occlusals. A good substitute is an inverted cone diamond approximately 1.6 mm in diameter. Used as a very thin liner in crowns that have been removed when doing retro-fit buildups. An example of this would be doing a crown or core buildup underneath an existing crown or fixed bridge. This allows the crown or fixed bridge to be removed with finger pressure after the buildup core material has set up underneath a crown or fixed bridge. After the crown is lifted off with finger pressure, access can be gained to remove excess cement, smooth extended marginal buildups and allow the crown or fixed bridge to be cemented with your choice of cement. The latex material is easily peeled off of a buildup or from the inside of a crown. It also can be placed on the bottom of a Key from the inside of the crown. This may provide a seal which prevents the cement from sticking to the Key should you ever wish to remove it. Used as crown removal instruments on fixed bridges which have adjacent abutments or a large number of abutments. The smaller one-quarter-inch diameter allows multiple crown removers to be used in the mouth at the same time. How to do this is described in "Using the Handouts to Remove Fixed Bridges." The Handouts are not included in the regular kit of instruments. They are available as a separate order. After the precision channel is made in the crown, with the Medium or Regular Metalift bur, a Special No. 14 bur is used to remove dentin and/or cement from under the metal surface of the crown. This avoids threading the Metalift instrument into the tooth under the crown. Threading into the dentin under the crown would only bolt or fasten metal to another object. Since the standard No. 14 bur cuts on the bottom surface, it is easy to inadvertently cut deeper into the dentin without being aware of doing so.we have found that some dentists have been going deep with the unmodified No. 14 contra angle bur causing this problem. We have enclosed a special bur that we call a Flat or Special 14. This is a standard No. 14 contra angle bur that has been modified to not cut further into the tooth below the crown; only on the sides to slightly undermine the crown. This special design will avoid cutting deeper into the dentin and at the same time be very effective in removing the dentin and/or cement from under the metal surface and make crowns easier to remove.